The Sony Xperia U is the baby of the new Sony Mobile Xperia range and the cheapest to boot but what has been sacrificed for the price point? The flagship Sony Xperia S is joined by a modified (and slightly smaller) Sony Xperia P with a custom WhiteMagic screen for great results in daylight. The Sony Xperia range looks great from the start, all smart blacks and smooth, edge to edge lines. It's the Armani of the smartphone world. Almost identical to the Sony Xperia P and Sony Xperia S from the front, the Sony Xperia U features rock solid build quality, intelligent placement of buttons with all the physical buttons on the right of the smartphone. The 3.5 inch screen means the Xperia tech has to be wedged into a small space and the Sony Xperia U is the chunky brother of the family - 12mm in depth compared to a 9.3mm iPhone 4s. The bottom cap of the phone can be removed and replaced with a custom colour - our sample came with a single pink cap. The biggest downside is the 8 GB of storage which can't be upgraded because the Sony Xperia range doesn't support MicroSD cards. If you want music on your phone, you'll need unlimited data for Spotify or be content with a small album collection. The 5 megapixel camera is brilliant (despite the lack of Exmor R tech) and manages the Sweep Panorama and 3D modes of higher-end models. It's fast too - especially from start-up - and has a powerful flash given the dimensions of the body. One obvious omission is the Micro HDMI socket, absent on the left hand side of this model. It's a nice to have for travelling but we didn't miss it in day to day use and DLNA is always an option if you need to stream content. NFC fits with the additional 'tags' you can purchase to touch in order to activate programmed functions. 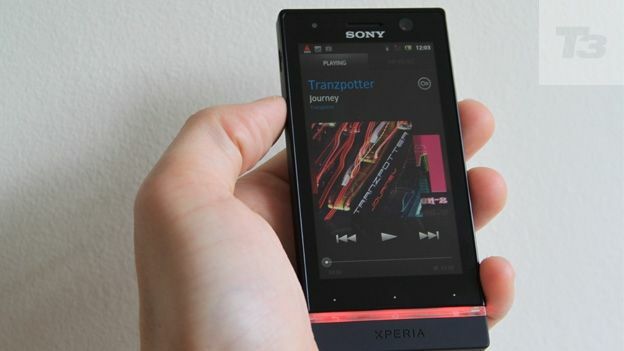 The light strip at the bottom of the Sony Xperia U also mimics the colour of pictures you're viewing, or the colour of your home background or album art. It's a gimmick unique to the Sony Xperia U but a clever one which is bound to get looks. The narrow display feels smaller against other Sony Xperia models but, at 3.5 inch, is a natural size for the money. The 854 x 480 resolution beats the HTC One V too - the Sony Bravia Engine makes the Sony Xperia U screen the very best for the price and size. The screen is responsive and reveals only a slight amount of glare during daylight. The Sony Xperia P is better for daylight use with WhiteMagic tech but it's obviously too expensive to make the cut for this lower end model. The Sony Xperia P managed a 5312 score via the AnTuTu app bench test, while the Sony Xperia U came in slightly lower at 4150. The big surprise is that the HTC One V managed just 2458. There's a 1GHz dual-core chip in he Sony Xperia P which means that slowdown isn't an issue - games, apps and menus are fast. The camera is quick, snapping from sleep mode in just 2 seconds. It's fair to say that for the money, it beats all £200 rivals hands down in term of speed. Browsing the web isn't the best of experience due to the narrow screen size - it's better suited to list based apps. Games suffer from the narrow screen size too, despite the power of the processor. The 1320mAh battery is removable and gave us a standard day of heavy use, which is disappointing for a smaller, budget phone. Charging time is average but we can't kick the feeling that if this is your first smartphone, you'll need a better battery life to ease you into the habit of daily charging. It's smart and well specified with a brilliant screen and camera for the money but there's nagging basics that we miss. A MicroSD card input is essential for an 8GB phone if you want any amount of music or video content. Out of the box, the Sony Xperia U offers just 3.79GB of available storage against the 32GB MicroSD upgrade option of the HTC One V. The poor battery can't offer more than a day of use either which, while removable, means that other options at this price point are more tempting. Smart but flawed, the Sony Xperia U is let down by chunky style, a small battery and poor memory options.